Hugh Cayless is a Senior DH Research Developer with the Duke Collaboratory for Classics Computing (DC3). He is a member and past Chair of the TEI Technical Council and is the Treasurer of the TEI Consortium. 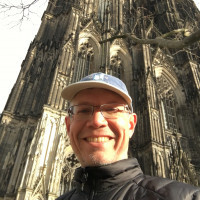 His current research interests include the development of tools and techniques for publishing digital critical editions, digital epigraphy and papyrology, and APIs for digital publication systems. Hugh holds a Ph.D. in Classics and a Master’s degree in Information Science, both from UNC Chapel Hill. A continuously updated schedule of talks is also available on the Digital Dialogues webpage. Unable to attend the events in person? Archived podcasts can be found on the MITH website, and you can follow our Digital Dialogues Twitter account @digdialog as well as the Twitter hashtag #mithdd to keep up with live tweets from our sessions. Viewers can watch the live stream as well. All talks free and open to the public. Attendees are welcome to bring their own lunches. Contact: MITH (mith.umd.edu, mith@umd.edu, 301.405.8927).